We have a very nice house, in perfect and safe conditions. There’s a good and clean pool and a relaxing hammocks zone, smoke zone and a beautiful garden, also, we have free WiFi and the service is exceptional and personalized, every of our guests get a Leticia's map for free. One of our biggest service is we provide a lot of information to visit the Amazon river and forest, according with your request, Different types of travelers can organize a wonderful experience at the amazon with us in company of local indigenous people. Leticias Guest House is located near to the center of Leticia, with an easy access to the port, by walking 10 minutes you can get to the city center. It’s a quiet neighborhood away from the noisy center of the city. From the door it is possible to see a small part of the Amazon River and in 10 minutes you can find the harbor, where you can see beautiful sunsets. It will take you 15 minutes by taxi to get here from the airport. 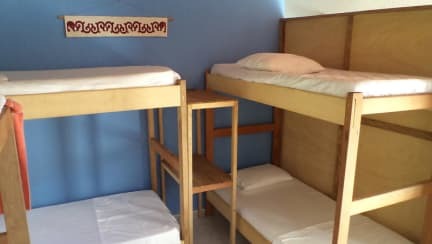 We have a dorm with 8 beds, also we have two private rooms with shared bathrooms and two others private rooms with private en suite bathrooms. None of our rooms have television or air conditioned.